The main goal of the Homestead diet is to revive the principles of our ancestor’s traditional diet, which has existed for hundreds of generations before the industrialization of farming took over in the middle of the last century. It’s hard to believe that less than one hundred years ago all farm produce was organic, all milk and meat was grass fed, and almost all the food was local, seasonal and prepared at home. No junk food, no highly processed food, no GMO’s, no chemicals, and no fresh tomatoes in February, just pickled and sundried. 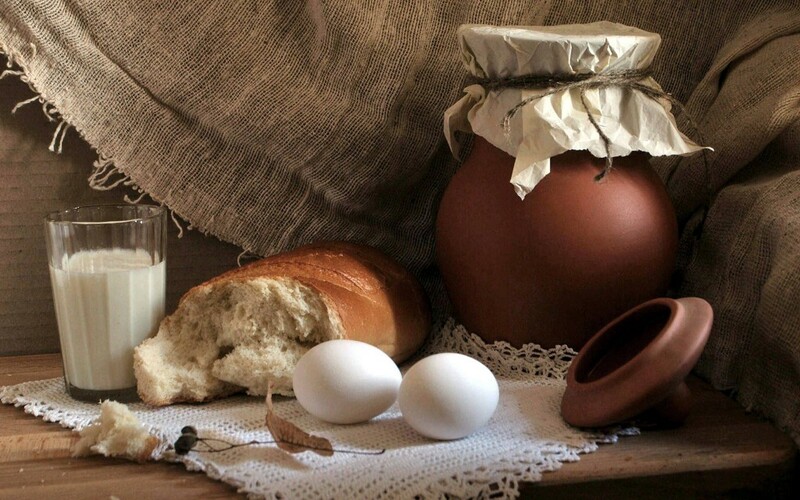 What our ancestors ate back then was sustainable, seasonal and simple. Since then our diet had changed a lot. And there is an increasingly growing concern among the scientists, environmentalists and consumers that these changes do not benefit our health, nor our environment. A lot of different approaches to diet have emerged as well as a lot of conflicting information about what to eat and what to avoid, many super foods have been discovered. And yet we are far from seeing the full picture. For quite a while dietitians have been researching the Mediterranean diet, Japanese diet and other diets of locales, which are known for their natural longevity. What we do know is that these folks ate, and some of them are still eating, locally grown, gathered and raised food. What they ate was naturally organic and seasonal. Their meat and milk was grass fed and pastured. Their meals were deliciously prepared at home. Their cooking traditions were passed down from generation to generation, together with family fermenting cultures and the secret recipes for homemade remedies. Don’t you think we should do the same? We can revive our ancestor’s Homestead diet by choosing seasonal, local, organic, small farm produce, by choosing grass fed meat and milk, by choosing pastured eggs and poultry. And we can revive the dying tradition of cooking and nourishing our families with healthy, warm, tasty home prepared everyday meals. It will definitely not hurt us. In fact, it may do us wonders.